We are fortunate to have made a trip to East Africa some years ago (thankfully, long before the current unrest there) for an extended camera safari, and while there we were naturally interested in learning about the local mushrooms. 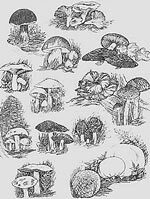 Unlike the animal world, there is very little literature about African mushrooms, and none of the camps where we stayed in Kenya and Tanzania had any books on the subject. We were re-introduced to Taylor Lockwood at the Fungus Fair in Santa Cruz, California this January and were reminded just how good this gentleman is at mushroom photography. We’ve seen many very talented fungal photographers in the twenty-plus years we’ve been avidly interested in mushrooms, but Taylor’s work is unique and simply unequalled. In Santa Cruz, he gave a fascinating slide presentation culled from his travels around the world. His photographs are always natural, no “photoshop” trickery. Lighting (usually from multiple sources), preparation of the subjects (cleaned and sometimes lightly misted), and what must be enormous patience are the keys. at the Santa Cruz show. Just when we think we’ve seen and heard it all, someone throws us a roundhouse curve. 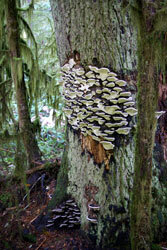 In the January-February issue of MushRumors, the bi-monthly newsletter of the Oregon Mycological Society, comes a report, originally reported by Paul Fattig in the Medford Mail Tribune, of the discovery of a gilled mushroom that grows underwater! 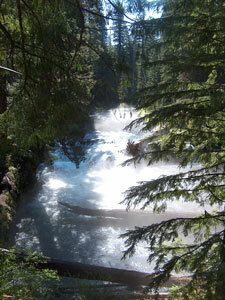 The upper Rogue is a wonderous site! Offering a recap (particularly our first on our website!) is a bit daunting, to say the least. We’re only two people, and our efforts are centered mainly in Curry County on the southern Oregon Coast, as well as in the Mt. Hood area of northwestern Oregon. You may well read this and scoff that your experience was totally different. Nevertheless, we have to call ‘em like we see ‘em, so here goes. Hedgehogs are always a favorite! The web abounds with sources for mushrooms photograph, supplies, foods, etc. We've listed below some of our favorites as well as some that have been recommended to us. As with all Internet sites, please check them out carefully. Could it be a conk condo? Congratulations to Ron Peters, the winner of our 2008 recipe contest! We loved the ease of preparation as well as the blend of textures and colors. The dish simply bursts with flavors! Chicken ala Ron has already become a favorite in our household! And, we are sure that you'll find it a tasty treat as well! Ron describes himself as a "home chef" with roots in Rhode Island. His favorite cuisines are Italian and Portuguese. Yes, Ron's entered recipe contests before, maybe 3-4 times, but this was the first time that he's won a prize. How did he develop this recipe? He admits that it came little by little. He first served it to his wife, then he made refinements in the preparation and finally he shared it with friends. Lucky friends indeed, we say! We were extremely pleased with the variety of recipes that were submitted. They came from near and far, from down the road in Curry County, from states such as Rhode Island and New York, and internationally from India. Some recipes were complex in preparation, others were more easy entertaining. We're so delighted with them that we have published a select few on various pages of this website. Take at look at them and give them a try - you will not be disappointed. While the entries were quite diverse, what the recipes and their authors all had in common was a very obvious love of cooking and the joy that comes from sharing food with others. We are touched and humbled by the contributions to our recipe contest. 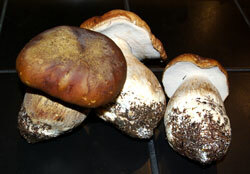 Boletes would be a great choice for this recipe. What a wonderful and thoughtful holiday present from sister Alice: a bottle of hazelnut oil! We've been having fun experimenting with the hazelnut oil by creating special dishes that focus on the flavors of not only hazelnuts but also of wild mushrooms. The following combination of pasta, mushrooms and hazelnuts really caught our fancy, so much so that we took it on the road and prepared it for that delightful couple in San Jose, Ted and Elizabeth, whom we visited when attending the Santa Cruz Fungus Festival. The dish is bursting with flavor and pretty on the plate...what a great combination to share with dear friends! We like pairing the Chanterelle, Shrimp and Hazelnut Pasta with mixed greens in a light Roasted Hazelnut Oil Vinaigrette followed by White Chocolate Hazelnut Liqueur Mousse for dessert. Is that too indulgent?